My vegetable garden plot is progressing. I feel a bit behind schedule, but I remind myself that this is only year one. Next spring there will be a raised plot in place. 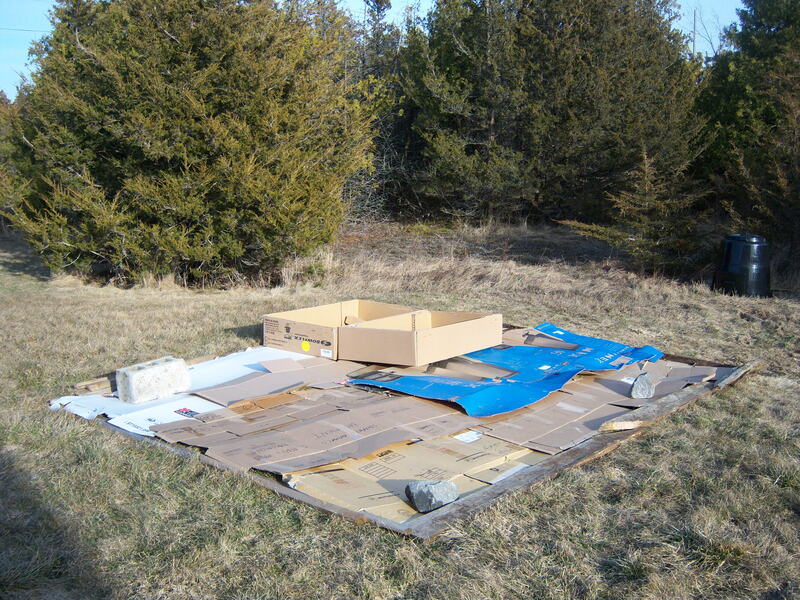 First, as noted in a previous blog, I marked out an area, approximately 12′ X 8′ and placed cardboard over the grass to suppress its growth. 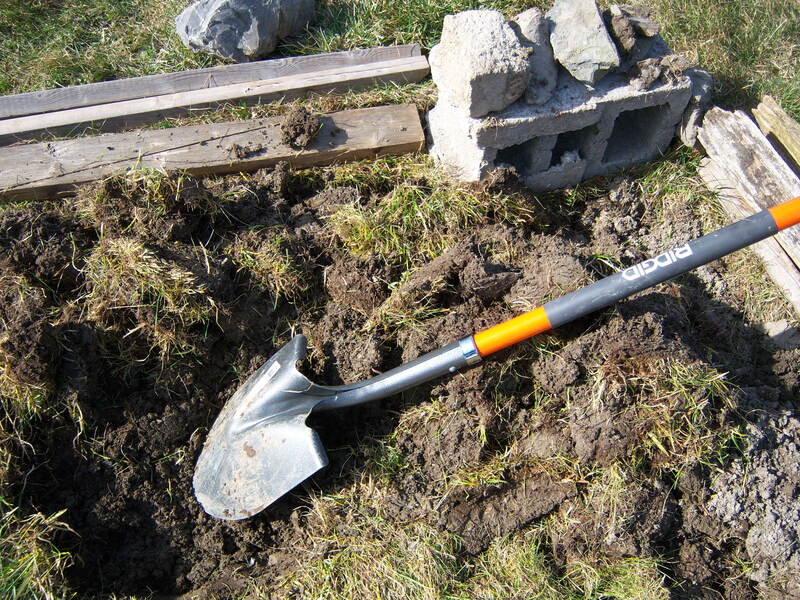 Second, I started the task of turning the sod over. This was not an easy task as underneath the few inches of soil there is heavy clay and rocks. Once I got going it seemed easier–the clay soil came out in slices, reminding me of a thick chocolate fudge cake. Third, I created two walkways in a T formation. The plan is to garden from the walkways and to never step on the beds. This will keep the soil loose and aerated. 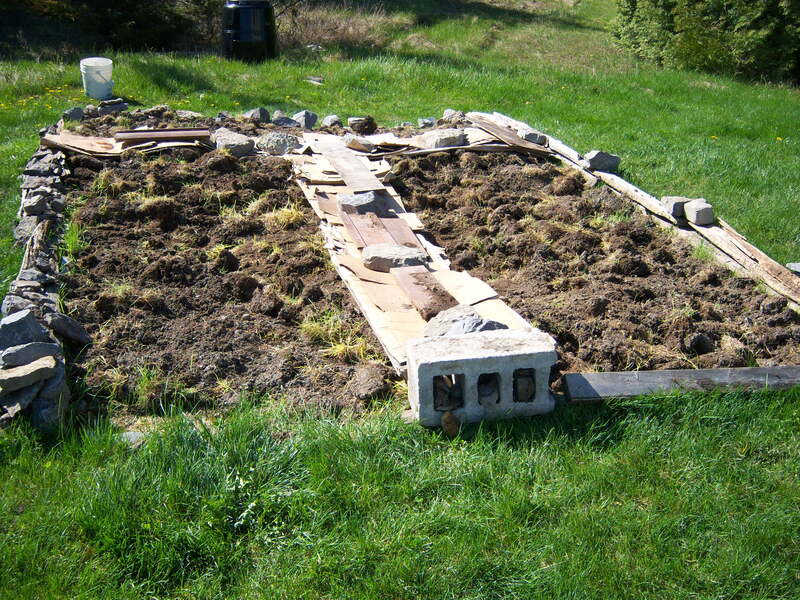 Two beds will be about 8′ X 3′ and the one at the end near the composter will be about 8′ X 2′. The walkways will be about 2′ wide. You’ll note that this will not be a “picture perfect” setup. I’m using materials on hand–cardboard, rocks, and old boards. What’s next? I’ll be adding a layer of garden mix (black earth, compost, and topsoil) on top. This will be the main growing medium and hopefully longer roots will find their way into the clay below. Right now, the surface that you see in the pictures is very heavy and hard to move– Over the years I hope to blend some of the garden mix into the clay. Since I’ll need 2 or 3 cubic yards of soil, I’ll be ordering a delivery from a landscaping supply company. And as a final note, here is some garden math that I have found useful: one cubic yard equals 3 x 3 x 3 = 27 cu ft. The largest bag of garden mix that I’ve seen at box home and garden stores has been 3.8 cu ft. Given the quantity I need, it would be much more expensive to purchase by the bag rather than from a landscaping place that sells by the cubic yard. I’ll talk more about my soil purchase and other progress in my next blog. “Picture perfect” setups be damned! I think it looks great! I haven’t really changed my garden setup from what it was when we bought this house, and I can attest to the fact that walking in your garden compacts soil and makes it more difficult to grow things in.